1. Preheat the oven to 200ºC, gas mark 6. Grease 8 compartments of a deep muffin tin. Remove the crusts from the bread and press into the muffin tins with the corners sticking up. 2. Squeeze the excess liquid from the spinach and spoon into the bread cases. Top each with a heaped tsp of the cheese sauce. Season the egg and pour into the cases to the top. 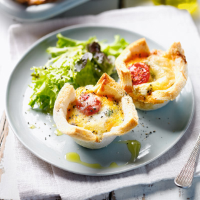 Sprinkle with cheese and top each with a halved cherry tomato. Bake for 20 minutes. 3. Meanwhile, heat the remaining sauce and pour over the egg in breads and serve with salad and the remaining tomatoes.